Late season English berries are large, juicy and full of flavour. 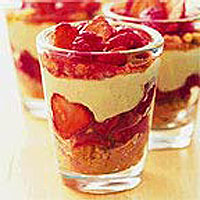 They are perfect for these simple, layered cheesecakes. You can make the cheesecake mixture, crush the biscuits and prepare the fruit in advance, but assemble just before serving to ensure that the biscuits keep their crunch. Crush the biscuits roughly by putting them in a food bag and hitting with a rolling pin. Try to keep a few larger pieces among the crumbs. Beat the curd cheese with the orange zest and 50g caster sugar until smooth, then beat in the milk. Whisk the cream until it just holds its shape, then fold into the cheese mixture. Pulse a quarter of the raspberries and a handful of sliced strawberries in a food processor, with 3 tbsp orange juice and the remaining 1 tbsp caster sugar for 1-2 minutes or until smooth. At this stage you can use the sauce as it is or pass it through a fine sieve to remove the seeds. Mix the remaining whole fruit with the sauce. Divide three quarters of the biscuit crumbs between four large tumblers. Spoon half the fruit over, then the cheese mixture, then top with the remaining crumbs and then the rest of the fruit. As an alternative to individual portions, layer this mixture into one large glass bowl. To make this into an elegant dinner party dessert, add 2 tbsp Super Cassis liqueur to the fruit sauce and serve the dessert layered in large wine glasses.